The weather is changing, the kids are in school, families and friends are gathering in droves… It’s a wonderful time of celebration, but with this time also comes cold and flu bugs! Your best defense against these unwelcome invaders is to stay balanced using healthy choices and seasonal wisdom. In addition, you can use the tiny but mighty Elderberry recipe as part of your daily defense regimen, or as a powerful remedy if illness does strike. Ayurveda thrives on prevention, and that’s why I love this little berry. In addition to helping fight off disease when it strikes, Elderberry syrup can be taken daily as a wonderful preventative. Its anti-viral properties and high contents of antioxidants and Vitamin C make it a great addition to your back-to-school regimen. About a month before the kids begin to go back to school, I give them about a tablespoon each morning before heading out the door. We continue this through the spring. You can purchase Elderberry syrup, tea and supplements from many health food stores locally. 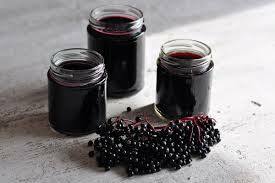 Or better yet, with a little effort and lot less money, you can make your own healthy Elderberry syrup recipe at home! It’s really simple, I promise! Take it by the spoonful, drizzle it on pancakes or holiday desserts, and share it with family members to keep everyone healthier and happier all winter long!